I can't recall exactly, the first time, that I stepped foot into the Roller Dome. I think I was ten or maybe eleven. 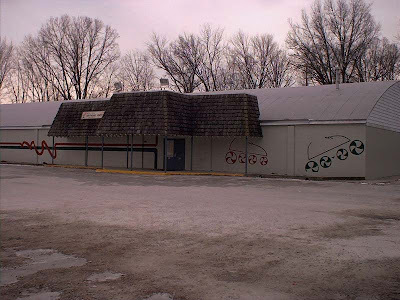 Growing up on the Southwest side of Fort Wayne, the Roller Dome was like "the" place to go on Fridays and Saturdays. So many times, my sister and I would stand outside, in the freezing weather, waiting in line, just to get in. There was always a crowd. ALWAYS. One exciting thing about standing in line (either freezing - outside - or freezing inside the lobby) was that you could hear the music booming from the rink area. The bass on whatever they played - literally - shook the entire building. Today, that might make me afraid :) but back then, it just made me want to skate MORE. My sister and I didn't own roller skates - we always rented ours. I wore a size 8. The skates were a flat-mud-brown color with black wheels and a black stopper (that thing in the front you were supposed to use when you wanted to stop yourself from skating). The wood floors upon which you did your skating - they were always clean. Note: this is the mother in me coming out. I never had a fear of tripping over random trash because the general population seemed to be hypersensitive about anything ruining their skating time. You see - the Roller Dome actually limited your skate time. When you purchased a ticked for admittance, it was usually for a two-three hour period of time. No one "taught" me to roller skate. It was a privilege to just pick it up on my own. I was proud when I mastered (okay - could do) turning corners. Before I could turn corners, I would just drift around them :). And THEN - the slow songs. Man! There was a lot of pressure. Would someone ask me to skate? Sometimes it happened. More than not - it didn't. I was a tall, thin, geeky girl with glasses and mousy brown hair. Note: no major girl crushes involved in the roller skating/Roller Dome set of memories. Of course maybe you wouldn't expect a 9/10/11 year old to go there but later on, maybe I'll tell you about Tiena Spears and Bobby Braun (4th grade - "going steady"). So here's a picture of the concession stand. The scary thing is that it looks exactly the same! I don't even think they've rearranged anything. 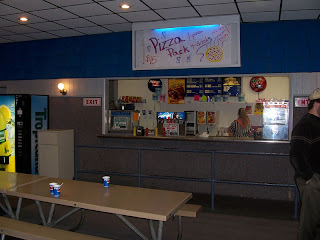 We were pretty poor so I didn't eat at the concession stand unless I was there for the all-night skate. Then, when you purchased a ticket for admittance, you also received a coupon for a hot dog and a soft drink. There wasn't a lot of trouble at "the Dome". The biggest issues had to do with the d.j. or the "official" floor skaters, busting people for thinks for a moment...what's the words??? Can't find them (definitely a sign of old age), but it was when more than two people were skating in a line and whizzing around the rink. The third person in this skate line always got busted. Getting busted meant you had to sit out for 'x' number of songs. My time with "the Dome" was cut short by my parents split. I've been associated with the Roller Dome South for over 30 years. It was nice to read an account from someone so excited and respectful of their experience. Thanks for sharing. Kristina--I think I pre-date your Roller Dome experience by about a decade (according to the music selections) but I had the same experience. It was a safe place and "totally cool". I look forward to your posts because the list of places you're looking for photos from set off memories like firecrackers on a string. Good luck w/ your blog. Even though I'm originally from Philly, we DID have skating places back there like the Boulevard RollerRink (my buddy was one of those "skate guards", and man, could he sail)! And those songs...well, we skated to them one night, and danced to them on another! We used to call that LINE you refer to (in Philly anyway) as "Cracking the Whip", and the last person in that line was always fly-ing!!! Wonder how many of us would even consider skating NOW for fear of breaking something we might need later this week...LOL! Nice to know that no matter where we all grew up, we shared similar experiences. This is the sista...do you remember the middle of the actual skating rink where you could go and practice skating backwards, forwards, and maybe learning to stop? While there was actual real skaters there trying to practice "tricks"? And how about the speed skate contest. I always did that. I thought of myself has the "disco skate queen." I do remember you wanting to hang out near the dj...yep that's right. I was always curious why people hung out in the furthest corner or the rink (ya know, the dark spot), now I know! Proof of how small the world really is... I was stationed in Berlin, Germany in the late 80's and one of my Dome friends from the North location was married to a guy in my unit... Imagine seeing a familiar face thousands of mile away in an unknown land. Thank you for the flash back!!! I remember having the time of my life at the Roller Some South. The Phillips boys it seemed like the best skaters ever. I remember the music, the all night skates and lots of fun. I now live in WV and miss Fort Wayne. I come home about once a year and cruise around just remembering all the fun and good times I had there. My Brother & I used to go every weekend back in 1970-71 when it was called Palms roller rink. "Groovy situation" by Gene Chandler & "Gypsy Woman" by Brian Hyland were the most played songs at that time. I loved going there & was a pretty good skater. I'd be lucky to stand up on skates now.